when using your Corporate Membership card. *An exclusive offer for enrolled Brooks Brothers Corporate Members. Offer is valid Thursday, March 10, 2016, until 11:59 p.m. EST online and by phone (for shipments to U.S. or Canada only) and until the close of regular business hours in all U.S. and Canadian Brooks Brothers Retail stores. Not valid in Factory stores. Visit brooksbrothers.com/stores for store listings. 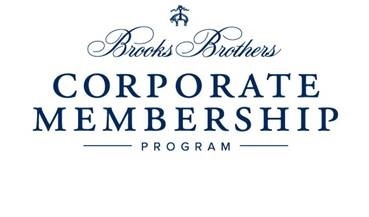 Please present your non-transferable Brooks Brothers Corporate Membership Card, temporary shopping pass or email confirmation at the time of purchase. 30% discount cannot be combined with your standard Corporate Membership discount or other promotion or discount, and does not apply to sale merchandise. In order to receive your discount for online purchases, your billing and shipping address must match the address provided when enrolling for a Corporate Membership Card. Excludes Made to Measure and Special Order clothing purchases, and applies to select watches and select Brooks Brothers shoe styles only. Discount may not be applied toward taxes, shipping and handling, monogramming and engraving, alterations or personalization. Not valid on previous purchases or for the purchase of gift cards or charitable items. If you return some or all merchandise, the dollar value of this promotion will not be refunded or credited to your account. Void where prohibited by law. No cash value except where prohibited, then the cash value is 1/100 cent. In order to receive your Corporate Membership discount online, you must create a separate Corporate Online profile, even if you already have an existing Brooks Brothers profile. You must allow 20 minutes after you receive your email confirmation before creating your online Corporate Online profile. Complete the entire form and enter in your 12 digit Membership Number towards the bottom: http://www.brooksbrothers.com/on/demandware.store/Sites-brooksbrothers-Site/default/Account-StartRegister. Your discount will automatically be applied to your order at the last page of checkout.